It’s been a year since Miss Eaves’ music video “Thunder Thighs” went viral, but this multi-talented feminist rapper has so much more to give. Her new EP, ME AF (a follow-up to last year’s Feminasty) comes out on August 3rd, and honestly, thank god. My "don’t f*ck with me, I’m a goddess" playlist needs some updating. Miss Eaves’ passion for empowerment and self-love is clear in her music. It’s not just the beautifully celebratory “Thunder Thighs”—the first single off of ME AF celebrates pubic hair (or, as they say in The L Word, “bush confidence”). Read BUST’s coverage of it here. And her latest video, “Kiss Kiss I’m Fabulous," celebrates Black girl magic. The video features people dancing joyfully in different New York City locations, while Miss Eaves encourages everyone to ignore haters and let their lights shine. "Hating is so tragic / I know I am fantastic / I got that Black girl magic," she sings. 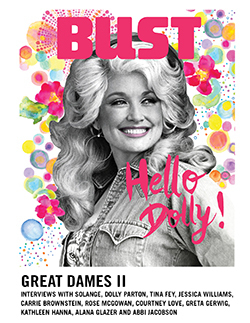 And um, did we mention she’s performing at BUST’s 25th anniversary party in Brooklyn on August 28th? We can't wait! Add Miss Eaves to your playlist, and come party with us. Top photo: courtesy Miss Eaves.